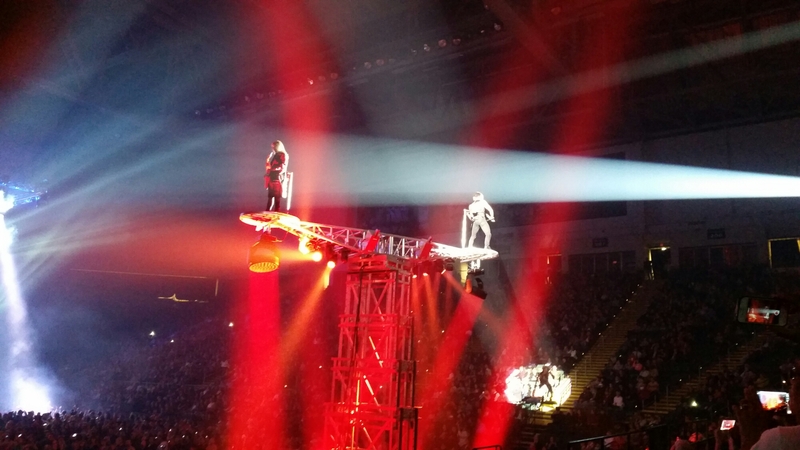 Last week, Jon and I had the pleasure of going to see Trans-Siberian Orchestra in concert again this year! We went last year and had such a good time that we knew we wanted to go again if they came back here again. If you’ve never been to a Trans-Siberian Orchestra show, you really should go! The music is fantastic and the performance is amazing. And you can bet that at least a few of the musicians will run up and down the aisles at some point. At our show, there was a separate stage at the back that raised and lowered- and the musicians mounted that stage and were raised into the air to perform. It was definitely neat! Their Christmas shows are normally split into two parts. The first part is a story based around one of their Christmas CDs. This year, it was “The Christmas Attic” (last year was “Lost Christmas Eve”). They have a storyteller (who has an AMAZING, deep, booming voice, by the way) that narrates certain portions as lead-ins to the music that weaves the tale. Each song played during this portion of the concert adds to the story and drives home the overarching theme of the performance. This is about 1 – 1.5 hours long. When the story ends, the lights come up, and the musicians come out on stage for introductions. They also do the typical thank yous to the audience, road crew, fans, etc. Then the lights dim again and the second part of the show starts. This is where they play all of their traditional favorite Christmas songs (if not already hit during the first part of the show) plus other songs off their non-Christmas albums. This also lasts 1 – 1.5 hours. Throughout the entire show there is smoke and lasers and lights and video… it’s quite the sensory experience, and supremely enjoyable. They also do a really good job of getting the audience to participate. And just watching the way they bound across the stage leaves me in awe- no wonder they are all in such good shape!! Jon and I also like trying to see how many bow strings the violinist has lost over the course of the night- inevitably, the bow is shredded and strings are flying all over as he goes to town on the violin! It’s pretty amazing. Have you ever seen TSO in concert at Christmas time? What did you think? What are other concerts/shows you try to see every year at this time? I’ve never been to a TSO show, but it sounds amazing!! Probably a little too much sensory stuff going on for the little ones, though. When do you plan on taking Ian? Oh Dory if you and Tim can go, you should! It’d make a great date night for the two of you!! It will probably be a while before we take Ian- there’s a lot going on and I want to make sure he’d be able to sit through it and enjoy it. I just can’t imagine taking a kid under 5 (or maybe even 8, really). And even then, I’d definitely bring ear protection!! It does get LOUD!